Admittedly, as I walked towards the Mission Theatre last night, on my first official assignment for NOWBath, I was nervous. The role of a critic is a tough one, and sometimes we have to be brutally honest. Imagining the worst-case scenario, I was expecting to be faced with an indulgent amateur attempt at a musical, which was more sickly than sweet, and would prove difficult to write kindly about. However, this was not the case. The Decent Rogues, written by Dan Lashbrook and Rob Pratt, was a joy to watch, and surprisingly, was unlike any musical I have seen before. The formula was simple: a mixture of comedy, romance and the element of danger all melded together to create a performance which had me on the edge of my seat by the penultimate scene. 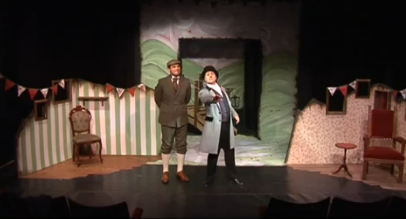 The likeable rogues, Percy and Bevan, played by Robin Fackrell and Duncan Mitchell, were endearing and charismatic, drawing the audience into the action from the get-go. They struck me as a pair of Robin Hood renegades, setting the world to rights, and despite their dastardly crimes I couldn’t help but root for them. This was bolstered by the dynamic chemistry that Fackrell and Mitchell had on stage, as every line seemed effortless when the two characters converged together. The ‘villain’ of the musical, Blinker, played by Jason LeMoir, was the perfect antidote to the buoyancy and merriment that is usually found in musicals, and with his dark, menacing demeanor, the foreboding drama was heightened, culminating in an audience mesmerized with what would happen next. Again, the level of acting was just right, with LeMoir pushing the extremities of characterization without becoming absurd. This refreshing realism could be felt throughout the play, helped by a witty and engaging script that was full of hidden in-jokes and laughs. The real gem of this play, however, was to be found in the development of the minor characters, most notably, the gravediggers, (Jason Crook and Rich Newman), the tea ladies, (Lesley Chapman, Charly Crook and Vicki-Leigh Usher), and the police constables, (Nicholas Burgess, Richard Pugh and Richard Grinter). The great attention and care that was given to these characters was evident, from the Monty Python-like lisp of Reverend Beauchamp (Geoff White), to the high-pitched squeals of Mavis Darling (Vicki-Leigh Usher). This attention to detail and care was shown in every possible outlet, from the lively, catchy songs, which I found myself whistling on the walk back home, to the scenery, which was simply but carefully done by Natalie Remington. The lights and effects which were used were appropriate and subtle, and the choreography, which the cynic in me wanted to hate, but just couldn’t, was the right mix of simplicity and comedy. All in all, there was a lightness of touch to the production that can only be credited to the director Petra Schofield, and the great partnership of Rob Pratt and Dan Lashbrook. A great romp of show, it had me laughing, crying and fully enjoying my first experience as a fully-fledged theatre reviewer, and for that, I urge you all to go and support a show that has had a lot of time, energy and love put into it. Our thanks to Jenny Lee (our theatre reviewer!) for this review.